IPSWICH PCYC Taekwondo students impressed at the fifth Gold Coast Open – the largest non State competition in Australia. In a remarkable effort, all 11 competitors left with a medal. “This was a tough tournament because most of the sparring students had to complete two fights in order to win a medal,” Ipswich PCYC coach Kevin Donaldson said. They also did their club and city proud with the way they behaved and supported each other. “The team morale has been excellent,” Donaldson said. 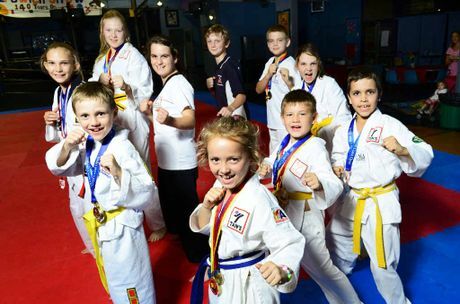 The next challenge for these and other students from the club is Caboolture Open Taekwondo Championships, from June 15 at Morayfield. Beyond that, a number of the Ipswich PCYC Tans Taekwondo students are current national champions who will defend their titles in Adelaide in October. Those eligible to compete at the 2014 Sports Taekwondo Australia (STA) National Championships are: Tamzin Christoffel, Ashley Holden, Ryan Holden, William Holden and Abigail Manders. Not all of them will be able to go to Adelaide if they do not secure sponsorship to help pay for travel and accommodation however. Students Ashley, Ryan and Tamzin are 2013 Australian champions for their age and weight divisions. If any Ipswich businesses would like to support these students, they can contact Kevin Donaldson on 0429 609 180 or the Ipswich PCYC on 3281 2547. Coach Donaldson has been invited to do his third Dan Black Belt grading in mid 2015 in South Korea at Kukkiwon, the World Taekwondo headquarters. Linsey Christoffel (White/Yellow 1 belt): won silver for poomsae. Tamzin Christoffel (Red III belt): won gold for sparring. Ashley Holden (Yellow III belt): won gold for sparring. Ryan Holden (Yellow III belt): won silver for sparring. William Holden (Yellow II belt): won silver for sparring. Jessica Malone (Yellow II belt): won silver for sparring. Scott Malone (Blue II belt): won gold for poomsae. Abigail Manders (Blue II belt): won silver for sparring. Marshall Roberts (Red III belt): won gold for sparring. Ryder Rundell (White/Yellow I belt): won silver for sparring and gold for the jumping high kick competition. Samuel Smit (Yellow II belt): won bronze for sparring.